Bird On Ground Or Hay With Human Scent - Let Nature Take Its Course? One day last year a church friend found a bird on the ground and worked for two hours on a roof I think, and all that time he never saw the mother return in that time. 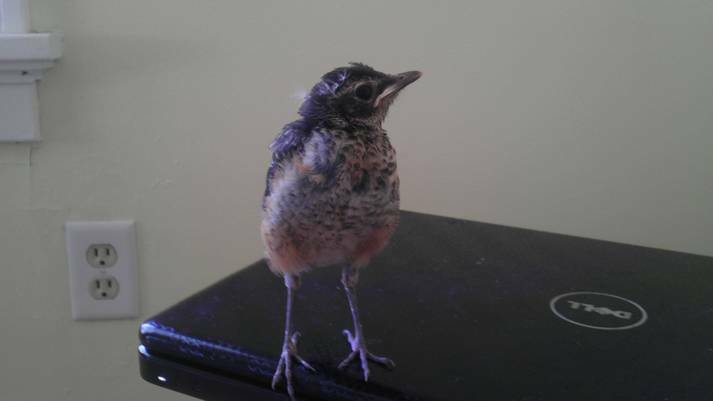 He brought the bird to my house knowing our vast experience with bird rehabilitation and release. He thought he would be wasting his time and the bird's chances by going on a ladder and returning it to the nest with his scent on it. Naturally we took care of the bird. It was a newborn and in need of help. We ended up having a longer time together than expected and named her "Gordo." 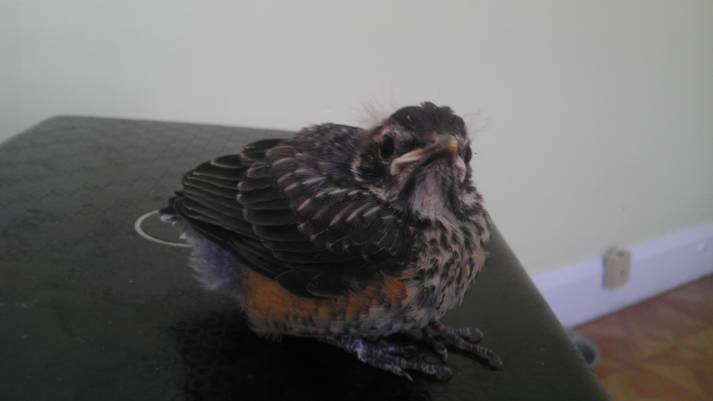 Regarding the pictures on this page and the videos, they are all of Gordo, the robin we saved, and gave to Nature's Nursery. We were hoping she would just come back, but she has not, yet, any way. We have personally released several birds successfully. Some even kept coming back for years! We haven't seen the robin come back, but... That story was a success story but it is only what should be done if you find a bird has fallen from the nest and is laying vulnerable on the ground and you can't find the nest AND IT IS NOT A FLEDGLING. But wait, if your friend is fully feathered? If it is not a newborn? This is possibly where mom wants them. 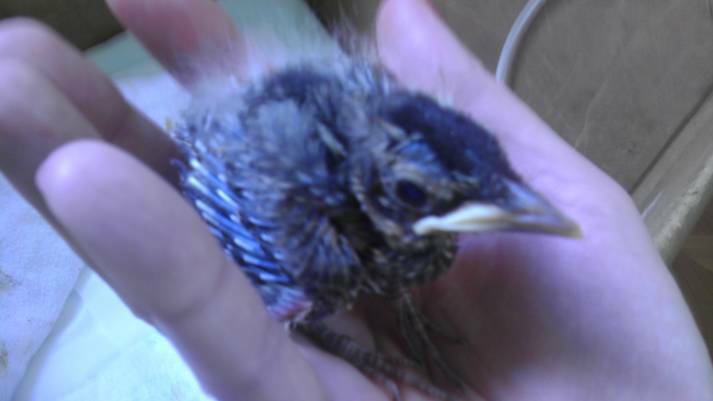 If they are fledglings, you need to be able to identify them as such because they need handled differently. Fledglings WILL be on the ground at a time in their development, for a couple weeks. Mom has FORCED them from the nest and wants them on the ground. Usually there will be more than one. This is NORMAL. This SHOULD NOT be interfered with. There could be only one if only one lives however usually there are two, three maybe more that are fledglings. What are fledglings? They are not quite adult size, but will look close to adult size, their beaks usually are more prevalent. The sides of the beak are more "plastic" looking, as in the image to the left and above. You shouldn't be able to see the feather chutes as in our images. Those are the hard centers to feathers. If you see the chutes or baldness, any fleshy skin? 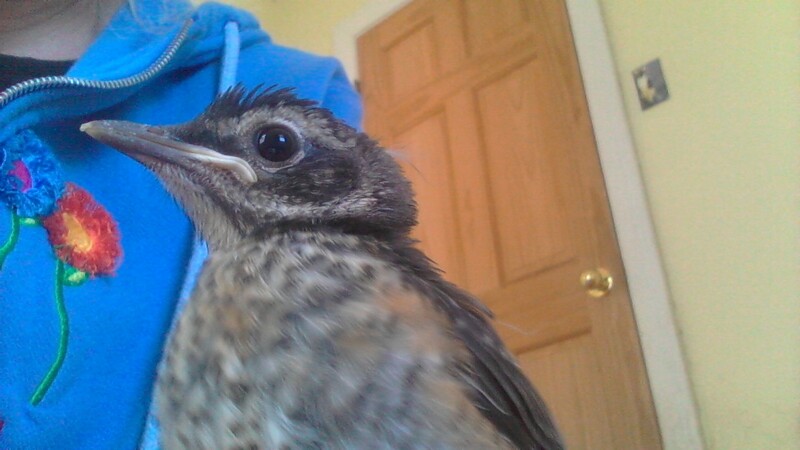 Then that's NOT a fledgling. The myth that returning the bird to his mother will result in rejection of the little tyke is just that; a myth. It is actually the best thing to do. The mother WILL accept the baby back into the nest. Human smell or not, offensive as it may be, will not deter the mother from accepting the baby's return; quite to the contrary as they can not pick up and carry their tykes up to the nest once they fall. Mama NEEDS your help! There is an argument out there is practical but impractically applied by people far too often; it is the adage that you "must let nature take its course, no matter what". If you let nature take its course does that really hold any credence? If your child fell in the street would you let nature take its course? It was an accident. 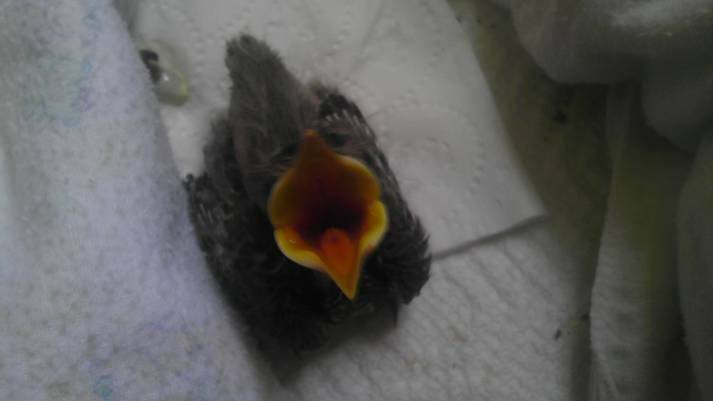 If it was an accident the baby bird fell why would you NOT intervene? Don't you protect humans from accidents? Do you ever let nature take its course with humans? Why take this stance regarding wildlife? It's asinine and beyond ridiculous! If you can help you help. Period. Under no instance do you see you can help and do nothing! Okay? Unfortunately internal damage happens and can go unseen and it is unavoidable if sustained. If it becomes fatal after a fall it was truly unavoidable. This is heartbreaking, for sure. Not all cases break your heart. Don't be afraid to try! If you have to rehab this bird you have to know if you have found a protected species. It is important to identify what kind of bird you have. Some species are federally protected such that they are illegal to possess unless transporting or housing until the bird can be taken into the custody of the Department of Natural Resources. House Sparrows are not protected but Tree Sparrows are. Starlings and Pigeons are not protected. Doves are. You would want to photo your new friend and email it to the Department of Natural Resources to identify it and advise you accordingly. If you are going to take on the task of providing rehabilitation benefits of care just know that meal worms are accepted by most species and are available at any pet store, bait shop, wild bird stores. We get ours at Wild Birds Unlimited where they are $15 for 1,000. Pigeons need Pigeon Soup. Please research this by Google. You want to put the bird in a box on a heating pad ON LOW (don't cook your bird) with a receiving blanket or a towel over the heating pad, or something to absorb the harshness of heat, BUT THE BIRD NEEDS HEAT TO REGULATE ITS BODY TEMPERATURE IF IT'S NOT FEATHERED!!! Remember too that even seed eaters feed babies insects. Meal worms will usually go over like hot cakes as a staple of their diet but you want to add a variety of different grubs and fruit. Dig out in the corner of your yard and within five shovels and you should have several cheap (free) grubs and slithering delicacies. When you are rehabilitating a bird you are going to want to mimic their natural diet. We will discuss grubs and worms. Whatever kind of fruit is native to your area you want to try to incorporate into your tyke's routine diet. House Sparrows and Starlings babies need fed to begin with every 30 minutes during daylight; essentially twelve hours a day; they sleep all night. They will not overeat. They will usually accept three to six meal worms per feeding, as they grow taking more. As they grow, you can space out the duration between meals longer than 30 minutes but each feeding will involve more eaten. Don't give baby birds water. They will get their moisture through meal worms. House sparrows LOVE ants. Caring for birds is a delightful experience and can at times be as challenging as it is ultimately rewarding to view the release and escaping flight " 'from those crazy people who just saved me.' "
"When your bird leaves", God said "remember he loved you." No truer words could be said on the subject. Hopefully it will be on the wind, by its wings, that your friend leaves your life. Birds are the most glorious creatures we share our world with. Majestic creatures of the air, friends who give kisses, recently proven to be the smartest creature after human beings; birds are enchanting symbols of God who need your help. Never turn your back or a blind eye when they need your help. Never. God bless you. God WILL bless you when you do help. Jesus said, "'whatever you do to the least, you do it to me.'" God is life, God is love, Jesus is life and love. You will be giving the ultimate fellowship of life and love when you are good to every form of life in your environment. You have nothing to lose and everything to gain. So do our birds, through you!